With its ultra portable profile, you can take Evapolar anywhere you want and use it to chill, humidify and purify air around you. Sounds great? Let’s keep going the desktop personal portable air conditioner. 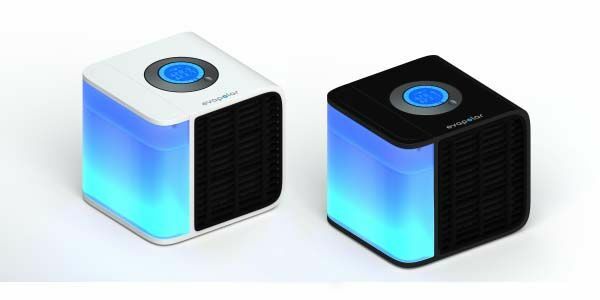 The Evapolar is an eco-friendly, energy efficient and multi functional air conditioner for personal use. The personal air conditioner measures 160 x 160 x 165mm, weights 1680g, and as we can see from the images, the Evapolar shows off a compact and sleek design, and when activated, built-in LED lights deliver us eye-catching visual effect. Unlike regular air conditioners using Freon or any other toxic coolant, the Evapolar utilizes a especially developed evaporative nanomaterial based on basalt fibers and water to cool the air around you, and the materials are easily recyclable and organic-free, so you don’t worry about them harming the environment or absorbing bacteria, moreover, the use of the nanomaterial makes the body of Evapolar one-tenth the size of a conventional air conditioner. Furthermore, unlike a regular air conditioner producing a strong cold air thread, the portable air conditioner spreads coolness smoothly just like natural air, and it has ability to reduce the temperature of the air around you to 21 degrees centigrade, while the power consumption is only 10W, and the pluggable water tank can be used 6-8 hours on one refueling. In addition to cooling air, the personal air conditioner also works as air purifier and humidifier in order to make you feel more comfortable indoors. Evapolar has been available for preorder on Indiegogo. 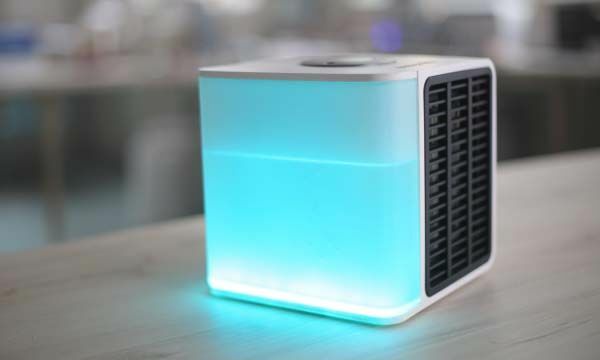 You can pledge $179 to preorder the portable air conditioner. It will be shipped in June next year. Update: the gadget has been available on Amazon for $179.99 USD.